Most people know that fuel is a key limiting factor during disasters or emergencies. Gas crises alone can cause cars to line up around the block. Add other disaster situations into the mix and you have a mess. This is exactly why the half tank rule is important. Keeping your car or truck above the halfway point is one of the easiest ways to stay prepared. Oddly enough, many people choose to risk running out of fuel by driving all the way until the light comes on before looking to refuel. This reactionary refilling can cause big problems if there is any sudden delay or shortage of fuel. 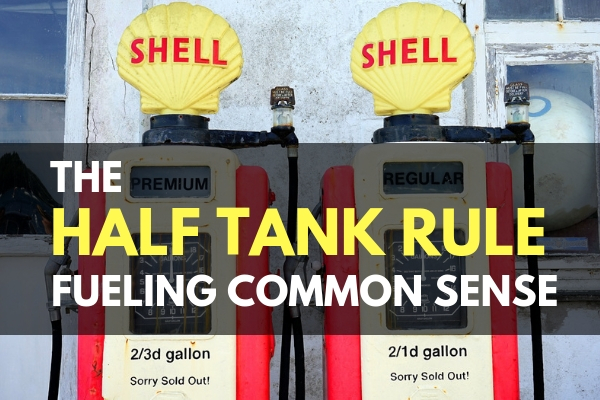 What is the Half Tank Rule? Always keep the tank in your vehicle at least half-full. It is that simple. We will go further into the benefits and the drawbacks below, but this one rule can help you out tremendously in almost any emergency, disaster, or SHTF situation. Have you ever ran out of gas? Most people have at some point. Hopefully, it was an easy remedy: have someone meet you with a jug of gas or hoof it down to the closest gas station. It ended up as an inconvenience that cost you some time. Realistically, this is the best outcome. Running out of gas during a gas crisis would be worse. Running out of gas during a regional disaster while trying to evacuate can be dangerous. Running out of gas during SHTF can be life threatening. All of these are risks of varying degrees, and they are all related to your gas tank. Keeping the tank at least half full helps mitigate these risks and can make disasters and emergencies have a lesser impact on you. Another practical benefit of the half tank rule is that you will never run out of gas again. Playing the game of chicken with the gas light in your vehicle means that just a few small problems can leave you stranded. With a reserve of half a tank rather than a gallon, you have a lot more cushion to absorb any problems with getting gas in everyday situations- not just emergencies. This can make you more reliable and timely, with fewer road incidents. Sure, there are some drawbacks to keeping half a tank of gas in your vehicle. For starters, you need to fill up twice as often. This eats up extra time often and can be inconvenient. It is best to see this drawback as more of an investment. You are investing extra time now to be perpetually better prepared, and possibly save time in an emergency. In this light, the inconvenience does not seem so steep. The half tank rule is just that- a rule and not a law. Feel free to break the rule if you really must. I would prefer you keep driving rather than stop to top off with half a tank left in the bad part of town at 2am. Common sense and situational awareness should always prevail over any arbitrary rule you read about online. The rule is there to help guide your general preparedness and is not a sticking point to follow in every situation. Fuel is a resource that will be scarce in almost every scenario we look at in our TrueRisk analysis. If you are properly prepared for emergencies, you know that your vehicle is a huge asset and keeping it prepared is a priority. Knowledge and following a few self-imposed rules can be just as important as your emergency car kit. 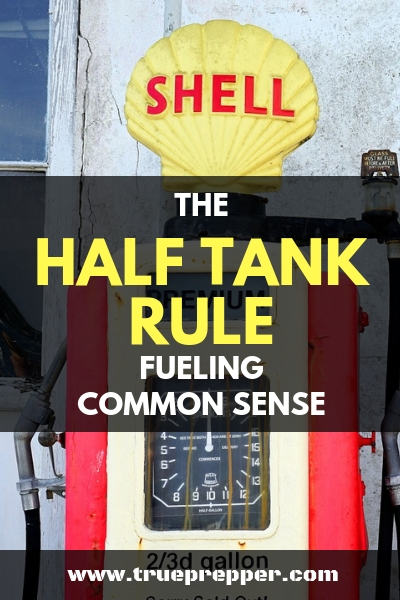 The simple half tank rule can keep you on the road and ready to tackle the next obstacle. Keep exploring, stay prepared, and be safe.